Enjoy ultimate well-being at Hawthorn Suites by Wyndham Columbus Fort Benning hotel. 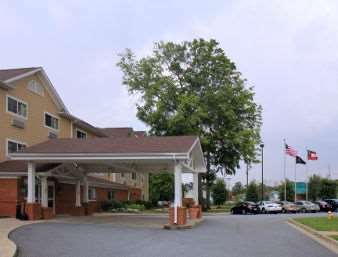 Located just one mile from Fort Bennings entrance, this smoke-free, all-suite lodging facility is perfect for business travelers and families seeking extended accommodations, with companies like Dolly Madison, Road America, TSYS, AFLAC, and Kelloggs nearby. Attractions nearby include Chattahoochee RiverWalk, the Columbus Civic Center, and National Civil War Naval Museum at Port Columbus, and there are several restaurants nearby. Amenities include laundry facilities, fitness center, complimentary wireless Internet access and complimentary large-vehicle parking, as well as meeting space and business center. Leisure facilities include a seasonal outdoor pool, volleyball and basketball courts, horseshoes, and complimentary continental breakfast is served every morning. Each of the suites is well appointed and equipped with an ergonomic work area, iron/ironing board, flat-screen HDTV, and fully-outfitted kitchen complete with full-size refrigerator, two-burner stove, microwave and 12-cup coffeemaker.